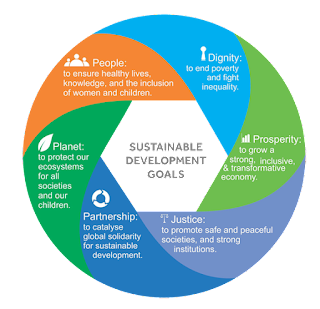 In 2015, after nearly 3 years of negotiations, the member states of the United Nations agreed to a final version of the post 2015 development agenda known as the UN 2030 agenda. UN 2030 includes 17 goals and 169 targets. One of the stakeholders involved in the negotiations of UN 2030 was IFLA, the International Federation of Library Associations. Access to information permeates many of the goals and targets and “IFLA’s consistent position is that access to information is essential in achieving the SDGs, and that libraries are not only key partners for governments but are already contributing to progress towards the achievement of the 17 Goals.” IFLA has continuously advocated for “the inclusion of access to information, safeguarding of cultural heritage, universal literacy, and access to information and communication technologies (ICT)” in the agenda framework. Like any library, the UKZN library can play its role in supporting the achievement of these goals, most notably Goal 4: Ensure inclusive and equitable quality education and promote lifelong learning opportunities for all. In my observation as a librarian at the University of KwaZulu-Natal, libraries are at the heart of schools, universities and colleges in every country around the world. Libraries support literacy programmes, provide a safe space for learning, and support researchers to use/reuse research and data to create new knowledge. It is therefore crucial for libraries in South Africa to realize Sustainable Development Goal 4. Adeyomoye notes that “lifelong learning is crucial in enabling workers to compete in the global knowledge economy.” According to Krolak,(2006) “the role of libraries and professional librarians is changing worldwide. Librarians are no longer passive keepers and preservers of books; rather, they have evolved to become facilitators of information and lifelong learning opportunities with an emphasis on service, identifying user needs and communicating solutions. Modern libraries are unfolding the community’s learning potential by providing information on community issues, such as health, employment, continuing education and local history. This equitable access to information is essential to enable educated and informed citizens to participate in a democratic global community”. The University of KwaZulu-Natal librarians are encouraging students to use the e-resources and printed material. The University of KwaZulu-Natal library is fundamental to the support of teaching, learning and research. We provide a technological advanced and innovative library service. The library is the central collection point on campuses of a vast store of information resources that will help students with their studies and prepare for lifelong learning. The University of KwaZulu-Natal library has a collection of books, journals and theses in both print and digital formats as well as multimedia material. The library also subscribes to core databases and has a digital repository (ResearchSpace) that stores the research output of the University. The University of KwaZulu-Natal library has subject librarians to assist patrons with finding information. Each librarian has subject specific support pages that are called Libguides. The subject librarians are there to assist students with finding information and using the library Catalogue that is a one-stop shop to search across all types of resources in print and online formats and to discover and expose students to the worldwide library collections. The subject librarians are there to provide in-depth assistance and expertise, advice on the use of suitable print and electronic resources, literature searches, research support and training. The University of KwaZulu-Natal library conducts user education by designing, implementing and facilitating strategic and pedagogically appropriate teaching and learning in the knowledge and skills (technical and conceptual) of access, retrieval and management of the information environment. As a strategic partner to the University of KwaZulu-Natal, to fulfill its goal for lifelong learning and pre-eminence in Research, the library has established research commons on all its campuses. A research commons is a dedicated space to support scholarship and research to its PhD and Masters students and academic researchers at the University of KwaZulu-Natal. This space provides a peaceful environment where researchers can access extensive electronic resources, work on their research, relax in a comfortable lounge area, and collaborate with colleagues. Kavulya (2004) pointed out that “the justification for investing in higher education libraries lies in the extent to which a linkage can be demonstrated between such an investment and improvement in quality, efficiency and achievement in university education”. At the university, the library has been seen as an instrument of teaching alongside lecture and discussion methods and the librarian serves as a teacher, guiding the student in the ways of investigation and research. This is achieved by first acquiring information materials to support every course in the curriculum and every research project of the faculty, and secondly organizing them in a manner that permits easy access to their contents and finally, ensuring that such access is facilitated by giving users the necessary skills to retrieve the required information. Kavulya (2004) Challenges in the provision of library services for distance education: a case study of selected universities in Kenya. African journal of library, archives and library science, 14(1), 15 - 28.